How single-payer health care went from a pipe dream to mainstream. How single-payer went from a pipe dream to mainstream. 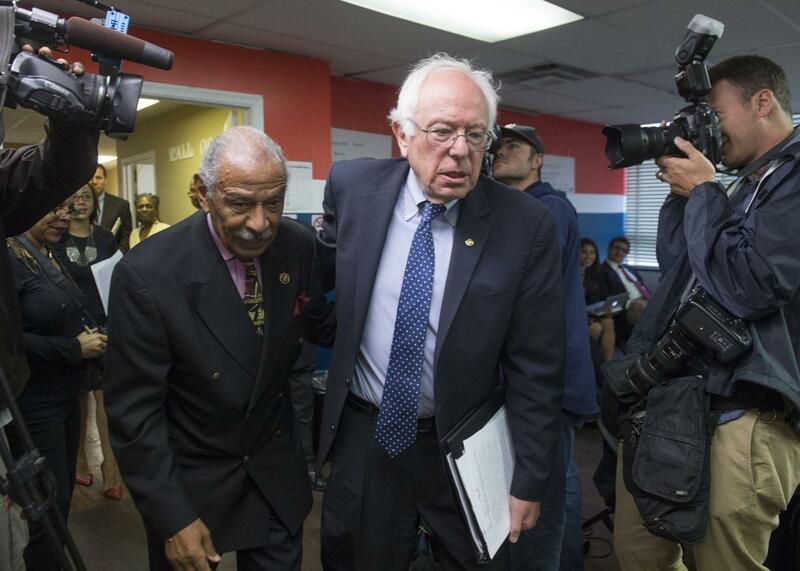 Rep. John Conyers and Sen. Bernie Sanders in Washington, D.C., on June 4, 2015. Sanders and Conyers have both supported single-payer. Single-payer health care is all the rage. At the start of the Obama presidency, the push for a Canadian-style, single-payer, taxpayer-funded universal health system was widely seen as a cause championed only by the hopelessly naïve. Now, as the New York Times reports, support for single-payer is emerging as the consensus position among congressional Democrats, with 112 of 193 members of the House Democratic caucus co-sponsoring Rep. John Conyers’ “Expanded and Improved Medicare for All Act.” In New York and California, meanwhile, Democratic lawmakers are pressing for state-based single-payer systems, and we’re seeing similar efforts pop up in other states as well. Bernie Sanders deserves much of the credit. Creating a single-payer system for all Americans was the centerpiece of his campaign for the Democratic presidential nomination, and I’d honestly be surprised if the next Democratic nominee didn’t take up the cause. Elizabeth Warren, to name one potential 2020 presidential candidate, is open to single-payer health care, and she’s not alone. Granted, support for single-payer is not quite as widespread among rank-and-file voters as it is among influential lefties. A Pew survey from January found that while 60 percent of Americans favored universal coverage in some form, only 28 percent supported single-payer per se. But other polls have found more favorable results, and my guess is that support for single-payer will keep increasing in the months and years to come. This is despite the fact that I believe creating a single-payer system would be a costly mistake, for reasons ably outlined by Chris Pope in National Review and Megan McArdle in Bloomberg View. Why do I think single-payer health care will keep growing more popular? Part of it is the availability heuristic. The more familiar the idea of a single-payer health care system becomes, and the more mainstream Democratic politicians embrace it, the “safer” it will be for people to support the idea. A single-payer system is no longer seen as a crazily socialistic idea relegated to the fringes of the political debate. It’s an idea that is taken seriously by serious people. Indeed, a key part of the new push for single-payer health care is branding it “Medicare for all.” Medicare is a single-payer system that offers coverage to every American over the age of 65. Though no one would describe Medicare as perfect, it’s pretty popular. So naturally the idea of opening Medicare to everyone has a lot of appeal. Of course, there’s a case to be made that Medicare has in some ways made America’s health system worse by serving the interests of politically powerful hospitals over those of patients, but I digress. The single-payer cause also benefits from the fact that Obamacare has been a mixed bag. While coverage expansion via Medicaid appears to have gone fairly smoothly in the states that have signed up for it, the move to expand coverage via Obamacare’s new state-based insurance exchanges has been far rockier. If the exchanges represent the best managed competition can do, it’s no wonder many have concluded that the smarter move is to further expand public insurance programs, as we’ve been doing for decades under Democratic and Republican administrations alike. Medicare for all is, according to this line of thinking, simply the next logical step. Here too there is another way of looking at things: Had Obamacare used the exchanges more narrowly as a vehicle for insuring the uninsurable, not as a means of transforming the entire individual insurance market, it might have proven more popular and effective. But the most important reason behind the single-payer boomlet, I believe, is the health policy failures of Republicans. While the GOP has spent years attacking Obamacare, it has proven utterly incapable of offering an attractive alternative. If the GOP had such an alternative, it would nudge centrist Democrats in its direction. But as long as the right doesn’t have a workable plan for fixing America’s health system, it should come as no surprise that the center of gravity on health policy is shifting left. Let’s say you buy the idea that Obamacare-compliant private insurance plans are way too expensive for the healthy and way too stingy for the sick, an argument Republicans have been making since the advent of the Affordable Care Act. Do you really trust the GOP to fix those problems? Or, given the parameters of the GOP’s American Health Care Act, do you suspect they’ll just slash subsidies for the poor and the sick and use the money to cut taxes for the rich? At the moment, the latter belief is an entirely rational one. If faced with a choice between the AHCA and Medicare for all, Republicans shouldn’t be surprised if swing voters wind up going for the latter. The AHCA is an inchoate mess that evinces no grander philosophy for caring for the sick and vulnerable. Single-payer health care is, if nothing else, a coherent concept that represents a set of beliefs about how health care should work. If Republicans want the single-payer dream to go away, they’re going to have to come up with something better than the nothing they have now.